Fun, inclusive high school mountain bike leagues are havens of competition that are changing the way kids—and adults—think about bikes. Leland, North Carolina was buzzing with excitement this past March. The state’s first National Interscholastic Cycling Association (NICA) high school mountain bike race was about to kick off the North Carolina league’s inaugural season. A few days before the race, the temperature became unseasonably cold. The forecast for race-day called for rain. League director Mike Long knew many of the kids didn’t have the right gear for the weather. He considered cutting lap times, shortening the course, even erecting 40-by-40-foot walled tents at the finish line and putting space heaters inside. Finally, he cancelled the event. A technology consultant for Ernst and Young, Long had spent three years working toward the race on a volunteer basis. He feared the repercussions the cancellation might have on the fledgling league’s momentum. Would the kids come out to race? When Long’s second race was also threatened by rain, he again feared the worst. Instead, throngs of racers arrived, and the race went off without problems. Despite its hiccups, which included another race cancellation due to weather, the North Carolina NICA chapter shattered expectations in its first year. It created 26 high school teams and four middle-school teams. The league attracted 310 total racers, averaging 200 kids per race. By the end of the season, three kids who had never owned a bicycle or raced prior to the league’s inception wound up on the podium, Long says. NICA’s success in North Carolina penned a new chapter in the organization’s nine-year history. NICA already thrives in states where mountain biking flourishes — places such as Colorado, Utah, and California. The organization’s ongoing challenge is to spread into regions where mountain biking is less popular, maybe even considered a fringe sport, in places such as North Carolina, Alabama, and New Jersey. So far, NICA has grown in these states with unfettered success. League executives and coaches point to its shrewd, professional business model and growth strategy for this success. NICA launches new leagues in places where community support is high, passions run deep, and commitment is paramount. Through its attentiveness and hard work, it assures new leagues will have everything they need for resounding success. NINE YEARS AFTER ITS founding, NICA is composed of 19 leagues in 18 states, with California, the league’s birthplace, split into NorCal and SoCal leagues. Expansion is still important. Each year the organization hosts a bid process. Representatives of potential leagues participate in five, hour-long webinars that detail what it takes to run a league. They then compile a bid, detailing the area’s potential to support a league, whether it will represent a state or greater geographical region, the area’s demographics, and so forth. A list of committee members must also be submitted, This defines who will invest the time and passion to build a program from the ground up. In a typical year, NICA chooses two or three new markets from the bids. The winners display the necessary desire and commitment to support a league. (In 2017, the list of worthy candidate leagues was five. As of press time, no decision had been made as to which leagues would be accepted.) So far, the model has worked. In 2016 NICA participation grew by 43 percent (19.7 percent of which are female) and its volunteer base swelled by 40 percent. Once NICA approves a new league, staff will train the new league’s leaders, offering advice on everything from volunteers to coaching to race structure, often flying them to existing leagues’ races and camps. The investment of time and cash in this process is sizable. According to Austin McInerny, the executive director of NICA, each new league costs the organization about $90,000. Through its up-front investment, NICA subsidizes the true costs of the systems that are needed for each league, such as the coach licensing programs, signage and race setup, and the risk management infrastructure. Through refinements to the process over the past decade, the overall investment per rider within the organization continues to drop. Before it launches, a new league is classified as “emerging.” It attains “project league” status once racing starts, and then can operate under NICA’s non-profit status. The majority of leagues fit this description — legal projects of NICA. Then there are chapter leagues, which incorporate in their own state, acquire their own insurance, and have begun the process of forming a board of directors. They’re moving toward affiliate league status. Affiliates — currently there are three, including Colorado, Utah, and Arizona, while a few others are on the cusp — are incorporated, have their own nonprofit status, and function as individual nonprofits. They, in turn, contract with NICA for coach licensing and other services. Being an affiliate league gives them independence, and helps NICA by reducing its financial burden. The league is no longer on NICA’s books. NICA does not have them as part of the accounting audit required as a nonprofit. Thus, as some teams become more independent, NICA has the bandwidth to aid other emerging leagues. And on it goes. NICA’s mission, after all, is to get more kids on bikes, and keep them there. Perhaps the most important lesson for new NICA chapters is the league’s focus on participation and inclusivity. While NICA sometimes promotes its all-star graduates — Axeon-Hagens Berman standout Neilson Powless got his competitive cycling start in a NICA league, as did retired UnitedHealthcare rider Lucas Euser — the league is focused more on participation than grooming stars. There are no tryouts. Everyone who registers can race. Coaches never tell a kid he or she is not good enough, and there is no sitting on the bench. “We’re using cycling to build these strong bodies, strong minds, strong characters, in an equal and inclusive way to fulfill our core values,” Long says. ALL OF NICA’S GUIDANCE and infrastructure cannot create a league unless there are volunteers on the ground to lead the charge. Often, this task falls on parents or teachers. Long worked with the Boy Scouts for several years before launching North Carolina’s NICA league. 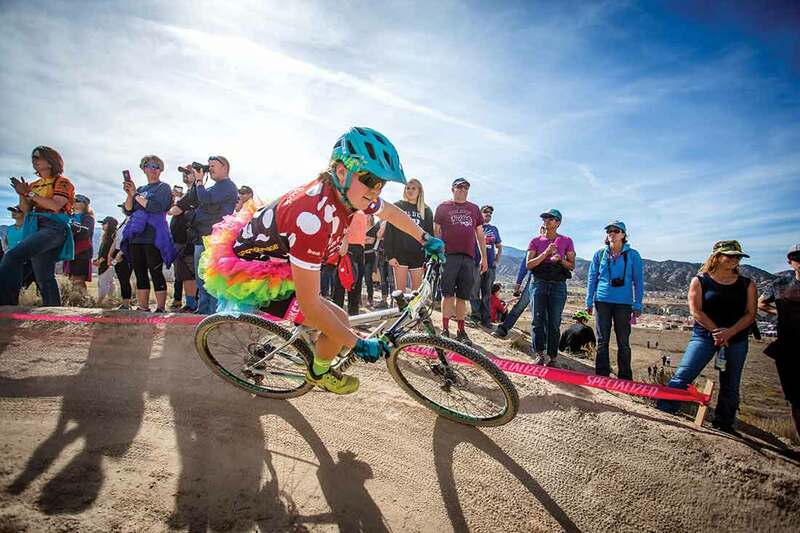 He’s been around mountain bikes for over a decade, and has guided his daughter, now a high-school athlete, in the sport since she was seven-years old. While creating a model for North Carolina, he looked to the success of NICA’s achievements in Utah and Colorado. To outside observers, the growth has been an amazing achievement. With that growth, however, has come its own set of challenges, says John Hutchinson, the league’s operations director. With so many kids, finding the necessary number of coaches is difficult. Likewise, finding race venues that can accommodate so many athletes is increasingly challenging. Finally, courses need to be fun and inspiring for a wide range of skill and fitness levels. “Our first challenge though: How do we be inclusive and not just be an elitist sport?” Hutchinson says. 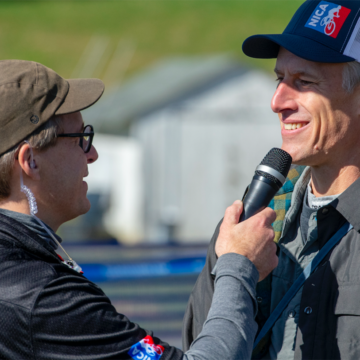 Hutchinson’s role includes organizing fundraising events, race-day preparation involving the management of 35-40 staff, plus 80 more on race day, organizing the league’s race series in the fall, and permitting with land managers, cities, and towns. He also hosts coaching summits twice a year. The most recent summit comprised 65 coaches who learned about teaching skills, concussion assessment, and matters of suicide, among other things. In a state ripe with talent and means, part of the challenge of running the league is making it attractive and accessible to everyone. In 2016 the league granted $22,000 in scholarships to assist those who couldn’t otherwise afford to race. Some of that money went to paying entry fees, helping with bikes, or travel costs. It creates a wide spectrum of skills and resources within the league. While some of the kids on Colorado teams will race for their high school one season then travel to Europe to race ’cross worlds the next, others will be on loaner bikes in cut-off shorts and a T-shirt. To balance competition with fun, the league encourages non-racing competitions. Activities such as tattoo contests, team sculptures, “posh pit” competitions (for the swankiest team tent), noisemaker contests, and best team chants help toward attaining the goal of communal enjoyment and a feeling of belonging. THE YEAR BEFORE THE North Carolina league was established, NICA scored another impressive win in Idaho. With some counties strapped by the demise of the mining and timber industries and others awash in cash, the state presented socioeconomic challenges to its volunteer leadership. Some rural schools in Idaho struggled to fund traditional sports, like football and basketball. The circumstances actually presented an opportunity for NICA, says Dylan Gradhandt, the executive director. “These places really have nothing,” he says. Gradhandt explains how that allowed NICA, with some starter money and scholarship funds, to get small programs started at the least likely schools. NICA’s launch has created a cycling culture in rural Salmon, Idaho, a remote town on the state’s central-eastern border. In 2015 Ryan McAllister launched a program at Salmon High School, where the school’s families have struggled with disappearing extractive industries. Within Lemhi County, 90 percent of lands are public. In the high school of 175 students, the year-old MTB team is seven members strong. One of three coaches, McAllister stepped up to form the team in hopes of exposing children to public trails in a way that didn’t require an all-terrain vehicle. A physical therapist, McAllister also hoped to spread the gospel of healthy, active lifestyles to the community. The kids — all boys at this point — have diverse backgrounds. They’re children of outfitters, hydrologists, bakers, ranchers, heavy-equipment operators. “There can be some pushback: ‘Hey, we’re loggers and miners; we don’t ride our bikes on trails,’ to ‘You guys are just a bunch of hippie dirt-bags, that’s not what our town’s about,’” McAllister says. McAllister says the team has slowly begun to change people’s minds in the small town. It’s the kids who drive the change. 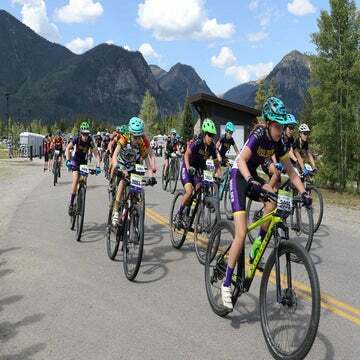 They have fun riding their bikes, they tell their friends, they educate their parents, and, with the help of coaches, they work with other user groups to help them understand public land issues, stewardship practices, and cultural shifts. Some 30-40 percent of the Idaho league’s athletes come from these non-traditional sources, towns rich in football heritage and very little in the way of cycling culture. The league’s aggressive outreach program is at least partially responsible for this surge in interest. They’ve discovered that many students will take an interest in joining a team but may have never actually ridden a bike. The outreach events are aimed at attracting those students. They are given the opportunity to meet local teams and try riding a bike for an afternoon. In 2017 the league brought a trailer’s worth of mountain bikes, helmets, and gear to communities at 20 such events. By contrast, Joel Zellers is the high school and middle school team director and head coach of the Wood River High School team. It serves the more affluent Hailey, Ketchum, and Sun Valley areas of Idaho. Zellers, who teaches special education and AP psychology, has a simple philosophy about getting kids on the team, and keeping them there. His team includes a few kids whose parents are well-known athletes, including former Olympians and Xterra triathlon winners. Most are not so athletically gifted. Some of them have never been able, or allowed, to participate in an athletic event or on a team, or even accepted by their peers because of their disabilities. The bulk of the student-athletes sit somewhere in-between. Zellers oversees 22 coaches, all volunteers. Eight of them have kids on the team. The rest are simply investing in their community, he says. For his team of 40 or so, he strives for an eight-to-two ratio of kids to coaches at twice-weekly practices. “The really fit kids are practicing more outside of school. And that’s my overall goal: I want these kids to ride with each other, on their own,” Zellers says. His best moment as a coach? Seeing two cars heading out from school with four bikes on top of each. The kids were simply going for a ride together. Winning, according to Zellers, isn’t the most significant objective of his team. Not even close. This sentiment is echoed throughout NICA leagues everywhere. Zellers requires team members to perform eight hours of trail work. He wants them to be good stewards of the environment. Race weekends are family affairs, with parents riding with kids before and after races. He wants the kids to be good people, and think of the team as an extended family. Zellers remains aware of what’s going on in his team at all times, diligent to include each kid in everything the team does, to avoid cliques. He wants the kids to grow together and become best of friends. Which gets us to the real heart of high school mountain biking: the kids. 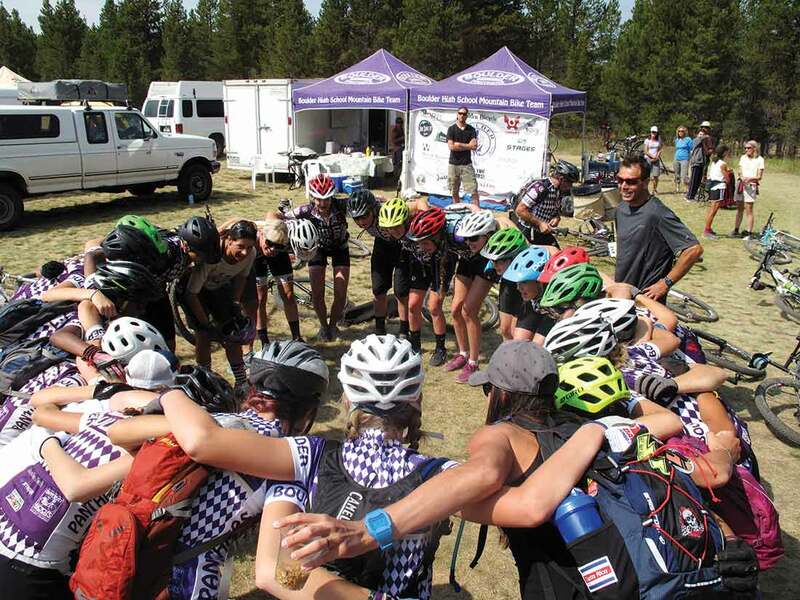 WHAT DO STUDENTS ENJOY the most about racing on NICA teams? Mary Brackett, who just finished her sophomore year at Twin Falls High School in Idaho, likes the challenge and inclusivity of the team. She has made lifelong friends. The team has become a second family, she says. “I would honestly consider mountain biking a part of myself now, so it’s hard to imagine going without it,” she says. She was initially nervous to join the team, due to her lack of mountain biking experience. But she quickly realized the atmosphere of her team and the greater league was incredibly inviting. It’s something that many of her friends have come to share in with her. Brackett is one of 12,000 kids nationwide participating in NICA leagues. Unlike Brackett, Ian Mullens, 19, grew up with mountain biking in his blood. He raced as a varsity for the Boise High School team (state champions two years ago, runners-up last year) for two years in the Idaho league. He was second overall in both seasons, and served as the team captain as a senior. That role helped him mature as a leader, something Mullens had never experienced before but which he came to truly enjoy. What comes next for NICA? The 19 leagues currently serve just under 60 percent of the country’s population, according to McInerny. There’s more demand for new leagues than ever before. Will there be 50 leagues some day? In the East, it may not make sense to have a league in every state, says McInerny. Maybe there’s a New England league, for example. What NICA will continue to do is provide opportunities for areas that aren’t currently served. It all comes down to finding people in those areas who want to work with NICA. To that end, NICA recently hired a development and partnerships vice president to help with financing the expansion. There’s been a steady increase in investment from some major cycling industry players. Trek has pledged a million dollars over five years, tied to the company’s tire sales. Conversely, the Easton Foundation, which has been the largest supporter of NICA from its inception, will end their relationship (to focus on archery, their core sport) after 2017. Trek and Specialized have created discount programs on certain models through their retailers. McInerny sees this as a way that brands can build family loyalty and grow cycling as a sport for years to come. Each league is also able to work with local and regional sponsors to bolster their funds, scholarship dollars, loaner bike programs, and so forth. The quality of NICA’s infrastructure, support, and professionalism has helped it surge in popularity across the country. It allows it to put on races that are on par with USA Cycling national events, says Long. It may be just for kids, but everything about a day at the races says pro. “Safe, fair, fun. A kid, a bike, a trail. That’s the universal truth of this racing,” Long says.